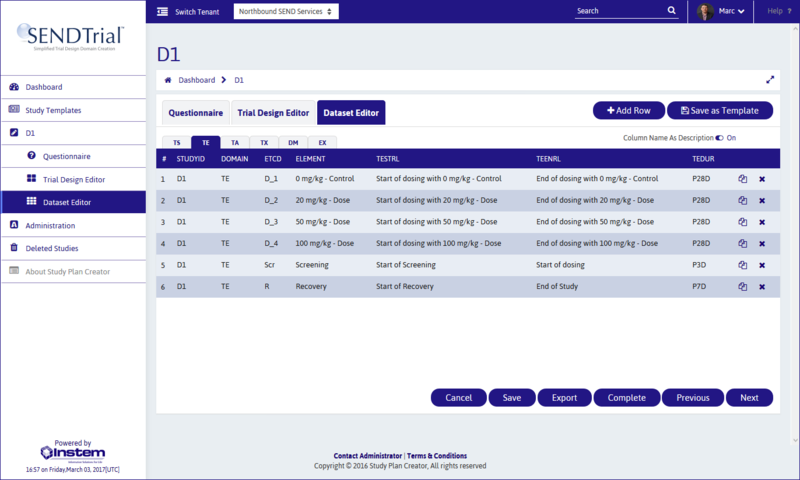 The SENDTrial™ solution offers organizations of all sizes the ability to more easily create Trial Design domains, which are often difficult to create manually or through extraction from data collection systems. Used with Instem’s submit™ solution or deployed as an independent product, SENDTrial is a full Web based solution that can be accessed through a subscription via the Instem Cloud or internally hosted. SEND Trial Design domains can be some of the most challenging, time consuming and error prone domains to create. Data collection systems do not usually have the required information, and are unable to describe the study’s plan in a way that easily translates into SEND. SENDTrial can generate these domains automatically. Questionnaire uses language familiar to nonclinical personnel, rather than unfamiliar SEND concepts and variables. SENDTrial offers a new approach – it becomes your SEND expert. You simply give it the information from the written protocol that it needs, and it figures out the best way to render that study in SEND. Much of the information required in SEND is not present in the data collection system and therefore not easily auto generated via the data extraction process. To work around this, some companies are trying to force as much SEND specific protocol information into their data collection system, even though it has no value to that system. Some companies are avoiding this simply by creating the SEND trial design entirely manually using something like Excel. This is extremely time consuming, error prone and is reliant upon highly experienced SEND experts, who are often in high demand for other SEND related activities. When using the approach of forcing SEND related data into the data collection system, this typically only works for relatively simple studies. The more complex the study, the higher the amount of manual intervention needed, until the tipping point is reached where it is easier to just do it all manually. SEND has its own concepts (for example Trial ARM and Trial ELEMENT) which are based on the clinical model and are completely alien to the nonclinical study protocol. Therefore, it takes a high degree of both SEND expertise and non-clinical experience in order to know how best to accurately describe the study in SEND. Until now, there have not been any tools available in the market to create the SEND trial design, which means that companies have been forced to rely on a significant amount of manual work to create these domains.